Last night I had such a wonderful dream. I was at the airport and I was sitting down talking to her and I asked her for some things. It was such an awesome dream. And I am so happy to say that it came true! Thanks Shin Hye! Anyways, today Shin Hye left Japan to go back to Korea after arriving on Friday as a guest for JKS's concert. Myself, along with three Japanese fans met in Haneda mid morning and waited for Shin Hye and her team to arrive. This is the greatest thing about being Shin Hye fans; when you meet another, there is no awkwardness between you. Everyone is so nice and friendly. That was what happened. So we waited and waited and it was almost time her flight time. 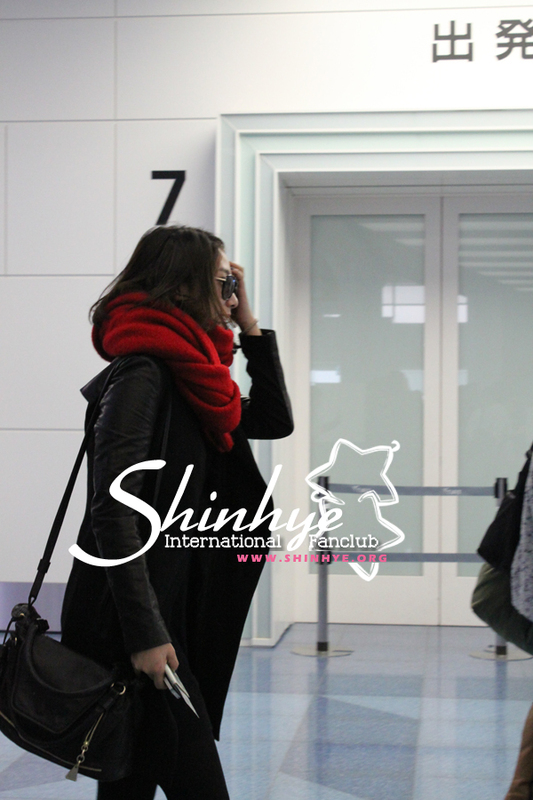 We got so worried that Shin Hye might have arrived early and already went inside to her gate. We waited anxiously and walked back and forth to see if we could spot her. We talked to pass the time. Everyone was so nervous. We couldn't help saying how fast our hearts were beating and how nervous we were! Yuki was the tallest of the four of us and she was the one who spotted Shin Hye and her team arriving. We looked and sure enough it was them. We grabbed our things and ran toward them since we were waiting by the check-in counters. I held up the banner that we've lost on Friday (Yuki went and got it back-it was in the lost and found) and Shin Hye and her team saw us. 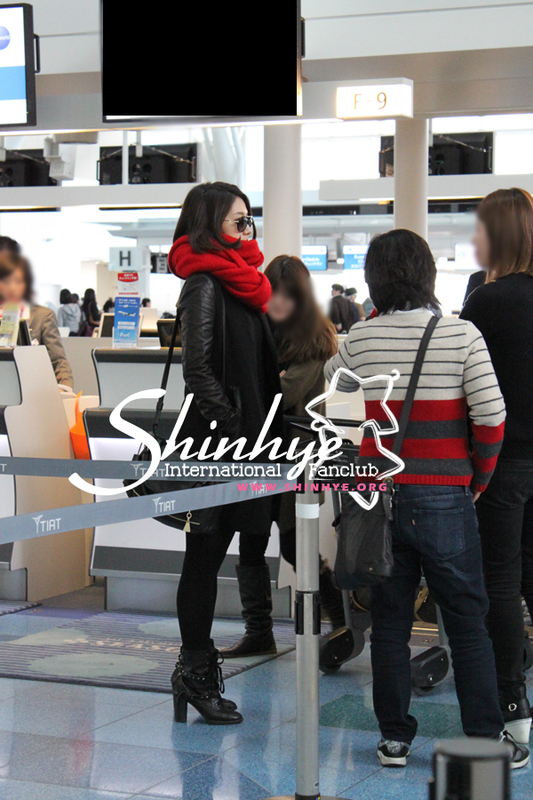 Shin Hye was so beautiful in an all black attire with her sunglasses and red scarf again. She looks sooo good in red! When we went to Shin Hye, it was only the four of us but then out of nowhere, there were so many people crowding around. My friends asked for her autograph and she kindly gave it to them. We were going to take a photo together but since there were many people there, the idea was abandoned. I felt really sorry because I kinda hogged her time. So sorry!!! And thank you so much! While Shin Hye was signing autographs for my friends, I talked to one of her team members in Japan. We talked and I told her where I was from. I love her team. They are so nice! I then told Shin Hye that I was at the concert and that I screamed I love her and her name. She looked at me kinda funny. HAHAHHAA. I know I'm super crazy. And of course being me, I couldn't think of anything to say except how beautiful she was! Hehehehehe. Well I did tell her that she did great during the concert and she was a little shy about it. She was so cute! Because I hogged her time, she was rushed to the check-in counter (SO SORRY!). As she entered the check in area, I asked her for a quick photo. She was soooo pretty!!!! We waited at a good distance as we watch she and her team check in. When they were done, they walked to the departure gate which was just across from the check-in counter. We waved and said bye to her and she waved back and smiled. I said bye to Joa and her manager unni and they waved and smiled back. We watched as her team went through security and I said good bye to her one last time and told her, see you soon. She turned back and smiled and waved at us. Then we watched as they rounded the corner and was gone. Trans: Going back to Korea. Thank you everyone for coming to airport. I had a lot of fun yesterday. See you soon goodbyeｖ（＾＿＾ｖ）♪"
I miss Shin Hye so much already. She's such a wonderful person that you can never get enough of seeing. Thank you Admins for all your accounts of Shin Hye. I live so far away that I may not get to see her (hope one day I will be able to travel with all of you to see her)but reading your accounts just makes me happy. Again, Thank you!! Thank you Shinhye. You're so supportive to your handsome oppa. Shin Hye is one talented lady and I wish she will get better opportunities to shine ! Love her all the way and will always support all the fans efforts in making her happy and giving their money and time to give her surprises. To me I have my favorite love team for her , but I will respect and love her no matter who she will end up with as long as she is happy. I wish for a drama for her that will showcase her dramatic, singing and dancing talent. I also think that she does a great job in hosting. I think JKS is the best for reel and real. And the both mothers will be happy.